It’s the first day of fall, but the forecast here in Georgia is for 90+ temps today, and we broke 90 all week last week. The weather is supposed to drop into the 80s next week, but it’s still a far cry from sweater weather! 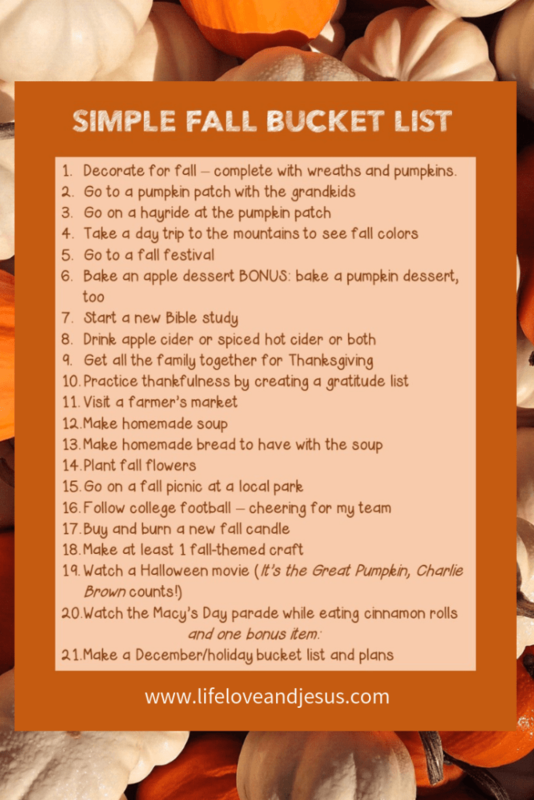 Still, it is fall and in honor of the season, I’m putting together a simple fall bucket list. The thing about bucket lists is this: they make me feel like a failure! “50 Great Things to Do” and I only did 3? Fail! “Adventurous Ideas for Your Summer” and I did none? Super-fail!! So, my list, created for myself and shared with you is small. Only 20 items, and some I know I’ll do so I’m slaying the failure before it gets to me. Take a day trip to the mountains to see fall colors – if you’re not near the mountains, use a fall screen saver or wallpaper. I’m heading to the north Georgia mountains in October. Get all the family together for Thanksgiving – including the only living great-grandparent. Plans already made. Make homemade bread to have with the soup – really love homemade bread! You can Google “fall bucket list” and come up with dozens, maybe hundreds, of lists of things to do. Some are repetitive – every list I’ve seen has ‘go to a pumpkin patch.’ But some are unique, thought-provoking, or encouraging. The idea behind sharing my relatively short and easy list it to encourage you and your family to be intentional about making memories. The years fly by, and before you realize it your toddlers are parents! Store up those precious moments – at whatever ages your children or grandchildren are – by being proactive. The list – printable in PDF format – is available in the Resource Library.